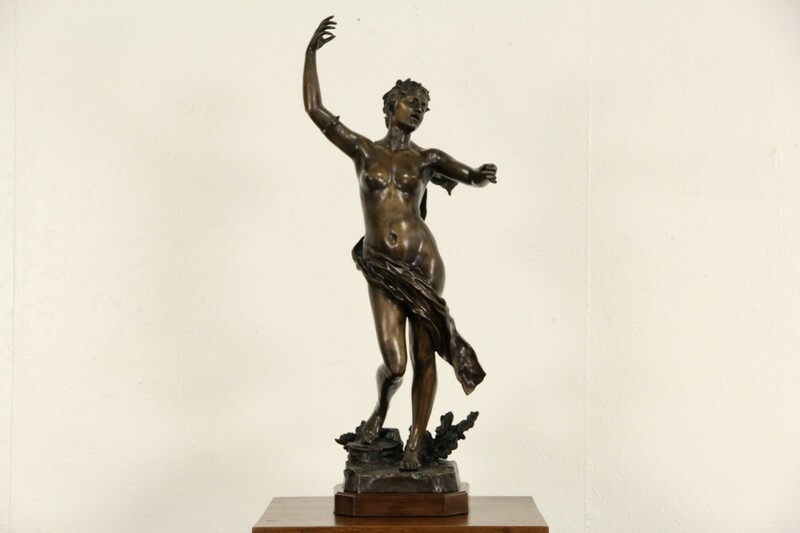 A beautiful "Venus" statue in bronze from around 1900 is signed "Felix Charpentier," the famed French sculptor who lived 1858-1924. Perhaps unsurprisingly, the artist married his model. Felix Maurice Charpentier began working with his father making bricks at age 7, but his molded figures showed such talent that he enrolled at the Ecole de Beaux-Arts in Avignon at age 16. His prolific works include public monuments in Paris and across France, also at the Portland Art Museum in Oregon. This naturalistic sculpture of the Goddess of Love has a warm chocolate patina. The base of this work of art is mahogany. Dimensions are 14" wide, 16" deep and 36" tall and weighs 60 lbs.